PROTECT YOUR SNEEZE GUARD INVESTMENT. TWO VERSIONS OF WALL RACKS TO STORE SAMPLERS, SERPS, OR CAROUSELS. Sneezeguard Solutions ® Wall Storage Rack System is designed to be permanently mounted to a wall in a storage area or facility. The Wall Storage Rack is perfect for storing your Sampler Sneeze guards, Carousel Sneeze guard or Serpentine Sneeze guard Systems up out of the way of floor traffic and possible damage. 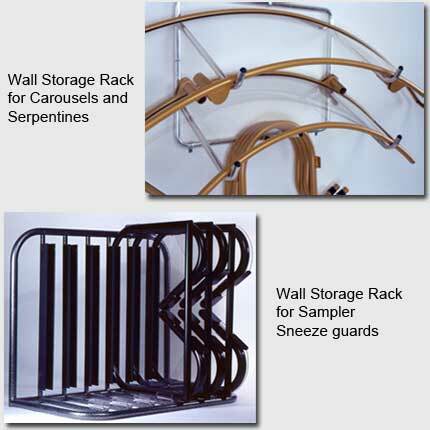 The Sampler Wall Storage Rack is made to hold up to six Sampler Sneeze guards while the Serpentine and Carousel wall Storage Rack is made to hold one Carousel, two Half-Round sections or two Serpentine sections. Cost Effective- Provides for easy installation and maintenance.